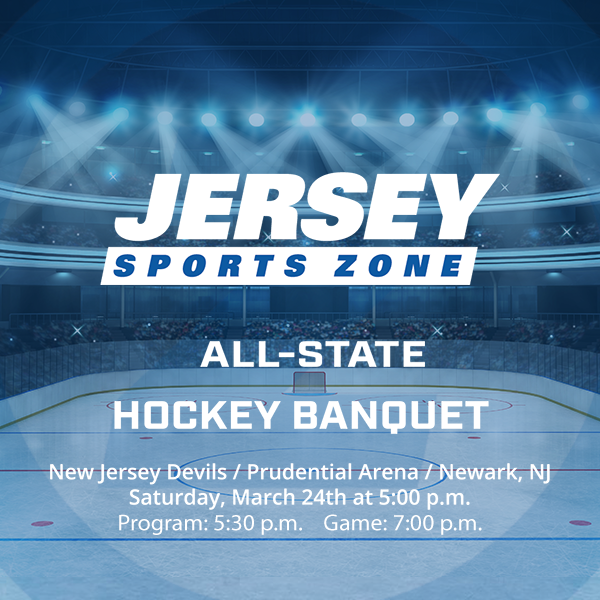 Jersey Sports Zone will celebrate the 2017-2018 high school hockey season with our first JSZ Hockey Banquet hosted at the New Jersey Devils’ Prudential Center. The evening will feature video highlights of every player in attendance and the announcement of JSZ’s Hockey Player of the Year. Following the dinner and ceremony, the Devils face off against the Tampa Bay Lightning. During the second period intermission, the JSZ All-Zone Hockey team will be recognized and the Top 5 Goals of the month will be featured on the world’s largest indoor video board in the world! Players selected to the All-Zone team and their head coaches are on the complimentary guest list. Parents, relatives, friends, and other guests are encouraged to purchase tickets for dinner/banquet and game. Please join us for a special evening at the New Jersey Devils/Prudential Arena and enjoy a night of hockey fun! Registration is at 5:00 p.m., Program begins at 5:30 p.m., and the Game starts at 7:00 p.m. Check in is at Ford Tower, located on Lafayette Street and Mulberry right by the Martin Brodeur Statue.